3 1/2 of 4 stars - House Theatre's 'United Flight 232' offers crucial life lessons from O'Hare-bound plane's wreckage - Chris Jones, Chicago Tribune 3/21/16 - "On July 19, 1989, United Airlines Flight 232, a DC-10 service, left Stapleton Airport in Denver bound for O'Hare International Airport with 296 souls on board. After a catastrophic hydraulic failure, the crew lost control of the rudderless jet, mostly, but still managed to crash land in the sunshine at Sioux (City) Gateway Airport in Iowa. The plane split into pieces on impact with the runway. Nonetheless, 184 people survived, many by jumping through flames into the cornfields surrounding the hastily-chosen hard landing. For some it was terra firma they never thought they'd see again; for others, a final resting place. Given the remarkable safety record of the U.S. air transportation system, all crashes are unusual. But UA 232 was unusual for another reason — the high number of survivors in a crash that simultaneously took so many lives. In this, the flight differed from, say, the 2009 crash of US Airways Flight 1549, wherein all 155 aboard survived thanks to the heroics of Capt. Chesley "Sully" Sullenberger. That story — slated to be made into a movie starring Tom Hanks as Sullenberger — had a Hollywood ending on the Hudson River. At the other end of the scale, of course, there was, say, United 93, which crashed in Pennsylvania after the Sept. 11, 2001, hijacking, leaving no survivors to say what transpired. That story of collective human pain had to be pieced together from radio communication, the cockpit voice recorder and passenger phone calls. So United 232 ended neither as badly as some nor as well as others, although most aviation experts regarded the crew's actions that day as exemplary. The number of survivors allowed the Evanston-based writer Laurence Gonzales to interview those grateful individuals for his exhaustive study of the experience of being on that DC-10 on that sunny day, when the airline was running a kids-fly-free promotion and the jet was full of children. That book, "Flight 232: A Story of Disaster and Survival," forms the basis of "United Flight 232," the new theatrical production at the House Theatre of Chicago, as adapted and directed by Vanessa Stalling. I have yet to recover from a visceral experience in the theater that is many things at once: deeply sad, inspiring, reorienting in terms of what is important in life, but nothing as intensely as a tribute to flight attendants, those noble, under-compensated workers of the skies who serve drinks to cramped, grumpy fliers for penny-pinching bosses while always taking the possibility of a crash very seriously indeed. Stalling — well aware, it seems, of how much attention goes to the cockpit and how little sometimes goes to those taking care of the terrified people flying coach — focuses in on Jan Brown (movingly played by Brenda Barrie), the chief flight attendant aboard United 232 and a woman who later devoted much of her life to the eradication of the practice of allowing lap babies on planes after watching close up how unsecured infants can become projectiles. The designer John Musial has transformed the space at the Chopin. You enter the theater through a faux jet bridge, with just the right worn carpet for veracity — and then you enter a performance space that's not a literal re-creation of a wide-bodied jet, by any means, but a very poetic piece of visual art that captures both the celestial thrill of commercial flight and the terror of leaving the ground in a metal tube over which no passenger has any control. There are no airline seats, no reminders of how much more comfortable flying was in 1989 than now, just a series of ordinary chairs that a cast of nine actors — known only as Actors 1-9 — manipulate as they encapsulate the various experiences of the flight. Stalling uses both a diverse cast and actors (Johnny Arena, Echaka Agba, Alice da Cunha, Elana Elyce, Rudy Galvan, James Doherty, Kroydell Galima and Michael E. Martin) who emphasize the ordinariness of the people they are playing, characters in a play who had no intention of being in a play at all. It's not bravura acting in the technical sense — indeed, there is some hesitation and awkwardness. But it works because the piece is so dependent on making you wonder what you would do in circumstances such as these. May they never befall you, nor I, dear reader. And let me offer some regrets if you are reading this on a (very safe) plane. This is not a show for nervous fliers — I take to the air a lot myself, and this gave me pause. But there are risks everywhere in life, and the very great artistic worth of this piece, beautifully toned and staged by Stalling, lies in its ability to make you think about what really matters in your life without going through such a harrowing day yourself. How better to honor those who lost their lives? On 232, the passengers did not suffer an instant disaster: They knew the plane was in trouble many minutes before the landing, and the meals kept coming and the in-flight movie kept playing. As on United 93, they had the chance to plan, if only for a second. Thank God, many of them were able to remember, and act upon, everything that flowed through their heads. Much of the play, told in first-person from those chairs, contains that material. It is well worth your spending 90 minutes in its company. This is not some kind of disaster exploitation, but an attempt at life lessons for the living. I sat behind what I think was a group of current or former United flight attendants Sunday night, and so it felt a bit like I experienced the play through them. The real Brown has been helpful to the production, I was told. I suspect many airline crew members will find their way to this show, which will help them understand yet more the crucial importance of what they do for us all. I'm off to LaGuardia tomorrow. I plan to listen to the safety briefing. We're all dumb in the dark". Highly Recommended - United Flight 232’ delivers spiritual awakening amid catastrophe - Hedy Weiss, Chicago Sun Times 3/22/16 - "To enter The House Theatre of Chicago’s production of “United Flight 232” — adapter-director Vanessa Stalling’s heart-stopping, all-consuming dramatization of Evanston writer Laurence Gonzales’ meticulous chronicle of an airline disaster — you must walk through a narrow passageway much like those jet bridges that lead from a departure gate into the airtight cocoon of a jumbo jet. And once you take your seat in the all-white space you almost instantly begin to count yourself among the passengers. You might also find yourself recalling how statisticians declare (even in this age of terrorism) that the chances of dying in a plane accident are significantly smaller than those of dying in a car. Yet not even the most frequent and confident flyer will deny that the thought of things going very wrong invariably drifts to mind, as you buckle your seat belt, as flight attendants remind you to check for the nearest exit door, or as the massive craft begins to bob and rattle during a period of severe turbulence. As it happens, the weather was fine on the afternoon of July 19, 1989, as United Airlines Flight 232 left Denver, Colorado, for Chicago’s O’Hare Airport, where it was to make a stop before heading on to Philadelphia. It was the peak summer season, and the DC-10 was full. There were 296 people on board, including (thanks to a discount promotion), an unusual number of children, some flying alone. About an hour into the flight there was massive engine failure that sent metal fragments flying. Those fragments penetrated the plane’s hydraulic lines, and the resulting rapid loss of hydraulic fluid made it nearly impossible to navigate the plane. Nearly. Even when all seemed lost, the extraordinary flight crew — highly skilled, and with many hours of experience and nerves of steel — remained hellbent on trying to land the plane at the Sioux City, Iowa, airport without crashing into a densely populated area in the process. Meanwhile, an equally determined and heroic group of flight attendants maintained remarkable decorum and calm, as did a number of passengers who engaged in their own acts of heroism and fierce determination. Although the plane finally slammed into a cornfield and burst into flames, 185 people managed to survive a disaster that easily could have consumed them all. Of course luck (being in the right seat, or making a move at precisely the right moment as the plane broke into five pieces), as well as the invaluable assistance of selfless souls, all played a part in determining who survived and who did not. Some would vow that prayer saved them. Others would say it was their promise to change their priorities if they were allowed to live. Many of the survivors suffered terrible physical injuries, but it was the emotional toll of the crash that, not surprisingly, took the greatest toll. The many and varied personal responses of all on board is an essential part of what makes “United Flight 232” so memorable. So are the almost absurdly comic forms of denial, as when food and beverage service continues for a while. The many forms of denial are on full display. So is the chanting of invaluable if mundane-sounding instructions (“Brace, brace, brace”). All this combines to make some of the most intense 90 minutes of theater in recent memory. While “United Flight 232” is a tale of true horror, it is far from the traditional “disaster movie,” even if Stalling’s storytelling has a terrific cinematic quality. Employing self-narration, body movement and the simple but clever use of chairs, her nine superb actors — including Brenda Barrie, Echaka Agba, Alice da Cunha, Elana Eylce, Rudy Galvan, James Doherty, Johnny Arena, Kroydell Galima and Michael E. Martin — make the stage vibrate with tension and disorientation, and create a sense of the full passenger list. And John Musial’s space-transforming set — hauntingly lit by William C. Kirkham, with vista-shifting projections by Paul Dezial, and sound by Steve Labadz — creates the perfect environment. Best of all, the disaster is matched by a spiritual awakening. For all the death, what remains of Flight 232 is a heightened sense of being alive". 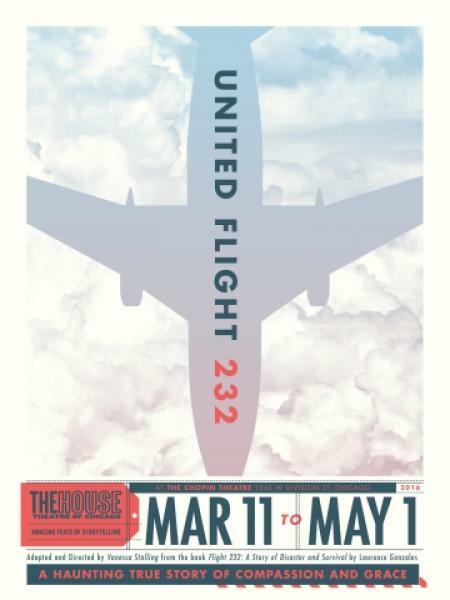 House Theatre 'United Flight 232' - Dan Jakes, Chicago Reader 3/24/16 - "Back in 2012, I saw a review by a certain Tribune critic headlined “Here’s why there aren’t more plays about air disasters.” Well, here's how to produce a phenomenal play about an air disaster. Vanessa Stalling adapts and directs Laurence Gonzales's nonfiction account of the 1989 crash landing of United Airlines Flight 232 that claimed 111 of the 296 lives onboard. A collaborative cast of nine retells, minute by minute, everything that went wrong, and more importantly what went right: a terrified but dedicated crew acting instinctively, and passengers getting each others' backs. It's an exquisitely acted and designed piece (a sound-dampening scrim creates an authentic cabin environment) from top to bottom, and a stunning House Theatre debut for actor Echaka Agba. Documentary theater doesn't get much better than this". “I love you, hurry home. I love you.” On July 19, 1989, a DC-10 headed for O’Hare with 296 people aboard is paralyzed mid-air. The crew hold back their own panic as they work to keep the plane from rolling out of the sky and crashing to the ground. Over the course of 44 minutes, all on board contemplate their fate as the descend for an emergency landing towards Sioux City, Iowa. As they plummet, we hear their own words mix with intimate, swirling scenes of neatly packed rows, chairs, and airplane wings. And we’ll experience the passengers’ terror turn not to panic, but to the most exceptional human kindness, illuminating the very best of what we are. Drawing on the interviews and research conducted by Evanston author Laurence Gonzales for his critically acclaimed book, Flight 232: A Story of Disaster and Survival, this brand new play is a reflection of our inherent sense of responsibility and compassion towards one another. From House Theatre - “I love you, hurry home. I love you.” On July 19, 1989, a DC-10 headed for O’Hare with 296 people aboard is paralyzed mid-air. The crew hold back their own panic as they work to keep the plane from rolling out of the sky and crashing to the ground. Over the course of 44 minutes, all on board contemplate their fate as the descend for an emergency landing towards Sioux City, Iowa. As they plummet, we hear their own words mix with intimate, swirling scenes of neatly packed rows, chairs, and airplane wings. And we’ll experience the passengers’ terror turn not to panic, but to the most exceptional human kindness, illuminating the very best of what we are.